Cap depressed to funnel shaped, velvety or smooth, cap margin tomentose, ochraceous, ochraceous brown, yellowish brown, reddish brown or rusty, usually strongly inrolled and remaining so for a long time. Stipe cylindrical, not exuding droplets at the base. 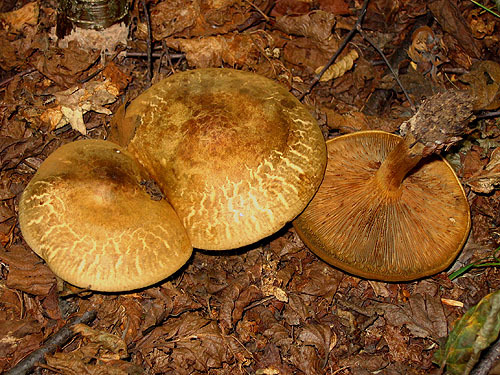 Gills forking, pale ochraceous, more brownish at maturity, bruising brownish. Flesh pale yellowish, turning more reddish when exposed to air. Spore print olive brown to rusty. Spores 7–11 × 5–6.5 μm. Rhizomorphs with small crystals (up to 0.5 μm). Habitat. Woodlands and scrubland, hedges and under solitary trees in parks and gardens. Mycorrhizal with a wide spectrum of trees, but often seen under birch (Betula), poplars (Populus), spruce (Picea) and pines (Pinus). Encountered sometimes on rotting hardwood. Distribution. In Europe widespread, although its distribution is somewhat obscured after few other species were recognized on the continent. Similarity. 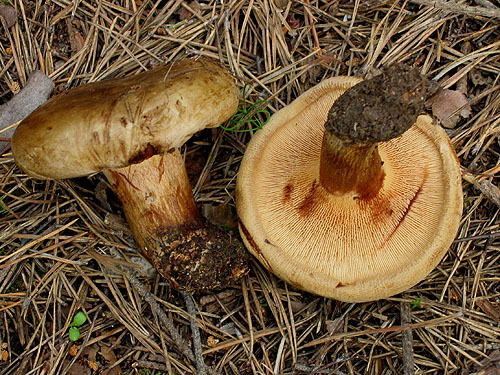 Compare closely with the rest of the species in Paxillus.